For every insect out there, there is another insect which will try to eat it or breed in or on it. Praying mantids are common predatory insects found in virtually any part of Australia in any habitat where they can find prey. Mantids are an insect Order all of their own known as Mantodea, comprising about 2,500 species worldwide, and about 200 Australian species. These insects are commonly called ‘mantises’ or singularly as a ‘mantis’ – but they are more correctly known as ‘mantids’ or singularly as a ‘mantid’. Mantids are instantly recognisable insects with their triangular heads and their characteristic way of standing with forelegs held together as if they were praying – hence ‘praying’ mantid (image below). 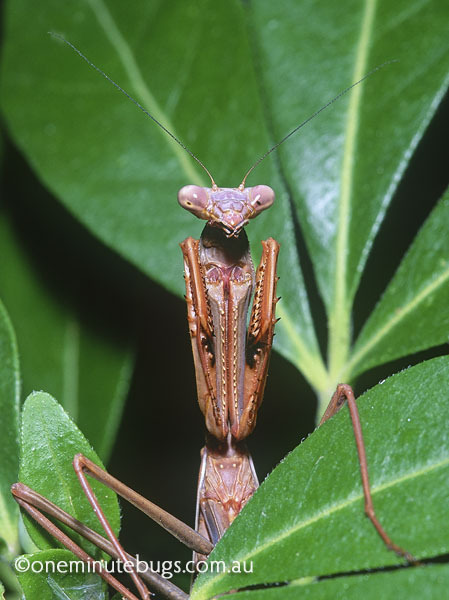 The word ‘mantis’ is derived from the Greek word for ‘seer’ or ‘prophet’, which probably alludes to their praying stance. There is a genus of mantids bearing the name Mantis – for example the classic ‘praying mantis’ Mantis religiosa found through Europe, Asia and Africa. 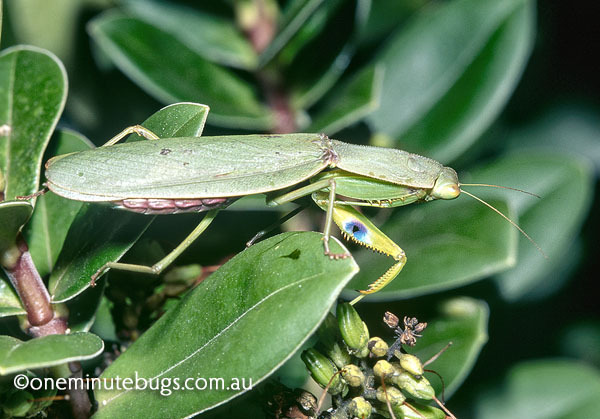 Australia only has one representative of that genus, a mantid known as Mantis octospilota. Mantids can be found from treetops to ground level usually widely dispersed and solitary. They are non-specific predators and will prey upon a wide range of other insects, and some large species have been observed feeding on frogs and small lizards. Mantids will attack and eat their own kind – which is probably why they are mostly solitary! Female mantids are known to eat males after, and sometimes during, mating. Serious entomological texts maintain that this activity is usually observed under caged conditions and rarely in the wild. Courtship usually doesn’t precede mating; males just tend to leap onto the backs of females at opportune moments. The triangular heads of mantids are very mobile and they have large eyes, which must help enormously when spotting prey . Mantid forelegs are armed with rows of spines (described taxonomically as ‘raptorial’). When prey is within reach, the forelegs are shot forward and the victim is impaled and held tight with the spines, and then lifted up to the mantids mouth parts and eaten alive. Some species sway from side to side while slowly stalking prey – possibly mimicking a twig swaying in the wind. Interestingly other insects such as certain species of katydids also sway like leaves in the wind, not to stalk prey but as protection from predators. 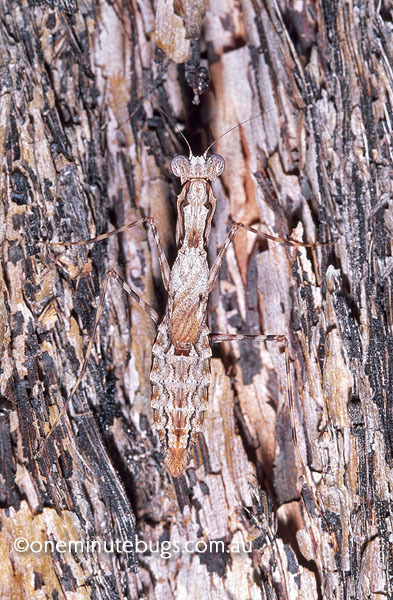 Most mantid species rely on cryptic colouring as camouflage and sit motionless, waiting for prey to come to them. The bark mantid Gyromantis sp. (image below) is a classic example. Males of most species have two pairs of wings, both of which are used in flight, while females of most Australian species have either reduced wings or no wings at all. A males of a large species in flight is a sight to behold. The forewings of winged species are hardened to protect the more delicate hind (flight) wings. Mantid species vary in size from about 10 mm to a massive 120 mm in body length. Common species such as the garden mantid Orthodera ministralis (image below) are about 40 to 50 mm in length. Mantid eggs are laid in moist frothy liquid which hardens into an egg case (ootheca). Egg cases and are commonly found on fences and tree branches, and may contain hundreds of eggs. The size and shape of the egg case, and the number of eggs within, varies from one species to another. 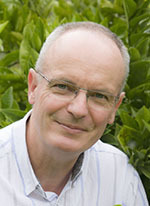 The eggs hatch into nymphs (essentially miniature versions of their parents without wings) which immediately hunt for and feed on small, soft bodies insects. The eggs of mantids are often parasitised by parasitic wasps and flies, and eaten by predatory insects such as ants, as well as by small mammals and birds. I kept a mantid egg case in a container to see what would hatch out. About 100 mantid nymphs emerged along with 50 or so parasitic wasps (Podagrion sp. ), which lay their eggs in the egg cases of mantids. 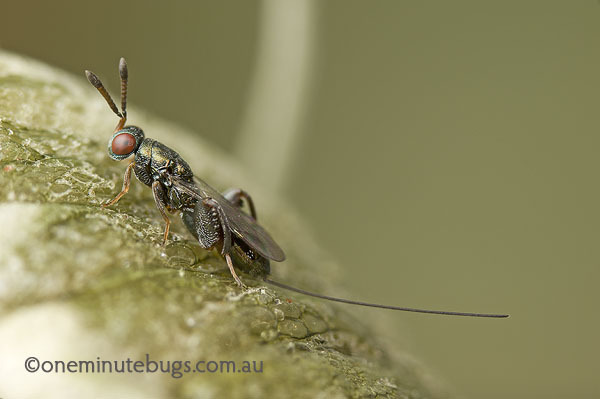 As you can see from the photograph here (image below) this species of female parasitic wasp has a long ovipositor, but she must insert it in a mantid egg case before it hardens. To achieve this she either follows the mantid female or hitches a ride (a behaviour known in zoology as phoresy). As soon as the mantid egg case is complete, she inserts her eggs inside. The wasp eggs hatch and the emerging wasp grubs feed on the mantid eggs within the protection of the mantid egg case. In the mantid case I collected many mantids survived these clever wasps and hatched before being eaten. Mantids are usually seen as being ‘good bugs’ but because mantids are usually widely dispersed they have little economic significance. Being non-specific predators they will attack beneficial insects as well as pest insects – unlike us they make no distinction between a pest fruit fly and a beneficial hover fly. However due to their low numbers they are unlikely to significantly affect populations of beneficials. My personal view is they should be seen as ‘benign’ i.e. neither good nor bad – and they are certainly interesting! This entry was posted in Mantid, Mantodea, parasite, predator and tagged beneficial, crytpic, mantis, ootheca by denisjc. Bookmark the permalink. Next → Next post: The Rain Moths are back!